Atypical lipoblasts and multinucleated giant cells are frequently found in well-differentiated sclerosing liposarcomas, although these are not essential for the diagnosis. 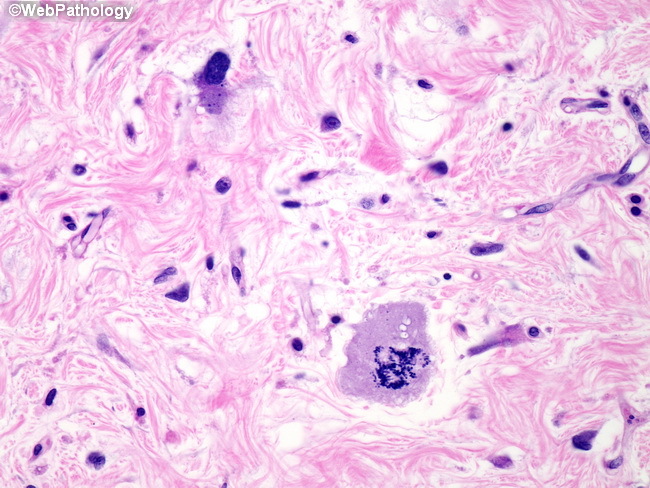 An atypical mitotic figures is also present in this image. In more than half the cases, the clinical course is characterized by one or more recurrences, often years after the initial resection. The recurrent tumors are usually histologically similar to the primary tumors. Some cases are complicated by progression to low-grade or high-grade de-differentiation.